We live our daily lives without being able to see the big picture of the community we live in. In Spring 2018, MiHyun Kim, Assistant Professor of Communication Design at Texas State University, led her students of Communication Design Graduates through Data Visualization course. The course focused on exploring and utilizing visualized data to gain insight into the ‘bigger picture’ of the communities we live in Austin. 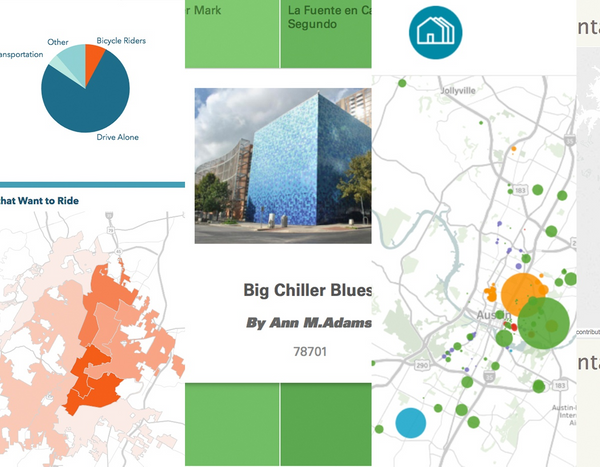 The students utilized the open data portal of the City of Austin to build fact-based stories and data visualizations that inform, persuade, and evoke audiences’ responses to take action – action to care and build more constructive environments for the community we live in. This workshop will walk you through the process of starting with the Austin Open Data Portal through to visualization of the data. The workshop will also discuss how to find and develop a fact-based story based on data sets, newspapers, articles and blogs. At the end, the students will have a discussion, led by Prof. MiHyun Kim, in which they will answer questions in regards to their specific challenges of the data visualization process and share tips on how to create an engaging story for data visualization design. MiHyun Kim is an Assistant Professor of Communication Design at Texas State University. Her ongoing research is an interdisciplinary project utilizing interactive storytelling and screen-based design work. She recently got awarded an Art Commission grant from City of San Marcos to create a participatory interactive storytelling experience to reimagine forgotten community stories. This event is exhibited during the Mermaid Festival of San Marcos, Texas in September 2018. She has been recognized from numerous national and international design organizations including ico-d (International Council of Design), AIGA Design Educator Community, UCDA Design Education Summit, and eyeO festival. Her creative works reside in the permanent collections of Purdue University, West Lafayette, Indiana, and The Denmark Poster Museum in Aabyøj, Denmark. The MFA Communication Design program at Texas State University is designed to provide advanced study in the areas of corporate advertising art direction, graphic design, and digital media design. The program employs web-based delivery through online video conferences, live chat and blogging platform. In addition, the program offers extended weekend seminars, evening courses and independent directed study which allows active professionals to participate in the program.